Window heat pump as its name implies is a heat pump that is mounted on window or through the wall of your house. An opening has to be reserved with the necessary dimensions to cater for the heat pump to be installed. This type of equipment provides heating during winter and cooling during summer. It is usually installed in rooms or motels where the space to be conditioned is not too big and individual control is required. 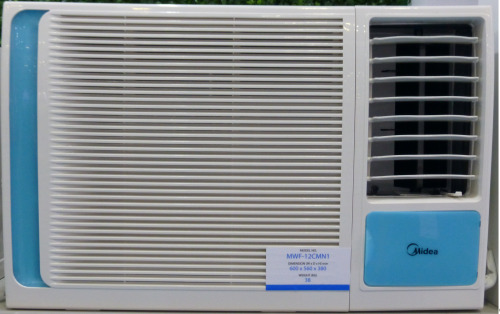 In recent years, this type of heat pump has been replaced with split heat pump. The latter requires only a small opening on the wall for the copper tubes and power supply enclosed in an insulation to connect between the indoor and outdoor unit. Furthermore, it is less noisy compared to the window type. However, the split type is slightly more costly compared to the window type. The cooling and heating capacities are one of your major consideration before buying any window heat pump. The capacities can range from 5,000 Btu/hr to 24,000 Btu/hr. Heating and cooling capacities are different. See the recommended area provided by the manufacturer. Typical cooling capacities are as follows. Heating capacity is usually lower. For instance a 8,000 Btu/hr cooling capacity may only have 7,000 Btu/hr heating capacity. Choose a model with a built-in electric heater if the outdoor temperature is 50°F or below during winter. Heater element is not as efficient as the vapor compression cycle and it consumes more electricity for the same amount of heat being generated. The older units use R22 refrigerant but due to the push for a more environmental friendly system, R410A has become the common refrigerant as it is ozone friendly. However, research shows that R410A contributes to global warming and newer design with lower global warming potential(GWP) will need to be produced in the near future to replace it. R32 refrigerant has lower GWP and is already available in split units applications. Window or Through the Wall are the two types of mounting that are available. The Window type may be mounted at the opening of the window but the gap in the windows must be sealed using suitable foam strip. For ease of servicing in the future, a slide-out chassis design will be better compared to the fixed type. In the slide-out type, the chassis is not fastened to the case and can be slide out for maintenance work easily. The fixed type has its chassis fastened to the case and the entire unit will have to be taken out for servicing. The Through the Wall type needs an opening on the wall for it to be mounted securely on the wall. Check the recommended hole dimensions from specifications of the unit. Auto restart will ensure that in the event the power supply goes off, the settings will be retained when power supply comes back. Timer to ON or OFF the unit is usually a standard feature. Sleep function helps to save energy in that the set temperature will automatically goes up higher(cool mode) or lower(heat mode) after a certain hours of operation. Remote control will come in handy instead of walking to the unit to change the settings of the unit. Safety certification such as UL should be available. Filter change indicator will be helpful to remind you of the need to clean or change the filter. The major components of the unit are all contained in an enclosure. There is a double-shaft fan motor that is used to move the air at the evaporator and condenser. Hence, the outdoor fan and the indoor fan share the same speed all the time. When the unit is running in cool mode, the indoor coil will function as an evaporator where cool air will be discharged to the room. During winter, the indoor coil will function as a condenser when it is running in heat mode. This is achieved by the use of 4-way-valve which will redirect the suction and discharge gas to its proper flow. When the outdoor temperature is low during winter, there is a possibility of the outdoor coil being freeze with ice. When this happens, the unit will go into defrost mode to clear the ice by running the unit in cool mode. This time, it will extract the heat from the indoor and use it to melt the ice accumulated on the outdoor coil. The supplementary electric heater will then kicks in to help provide the heating during the next half an hour (depending on design) or so of defrosting.